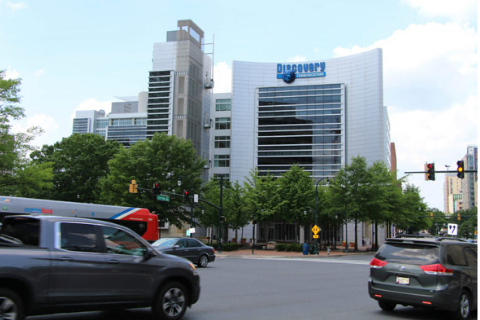 New redevelopment plans for the Discovery Communications headquarters building in Silver Spring call for space for office suites, shops, restaurants and a fitness center. In late 2018, the Potomac-based developer Foulger-Pratt and an affiliate of New York-based Cerberus Capital Management purchased the property at One Discovery Place and have filed a development application with county planners that outlines ways to “better position the property for multiple tenant occupants” in a building designed for a single company. The plans for the 545,429-square-foot office building, within walking distance of the Metro transit center and future Purple Line light rail, include removing fencing, creating a new entrance and redesigning a public plaza. Representatives of Foulger-Pratt said they have a letter of intent from a tenant to lease about 30 percent of the building, but did not disclose the renter. “Several other prospects are in negotiation,” the company said. The signature building is to be empty by April when Discovery, the owner of TV channels including Animal Planet and the Discovery Channel, completes a move to New York City following its purchase of Scripps Network Interactive. Montgomery County Council member Tom Hucker, a Democrat who represents Silver Spring, said Discovery was “an integral shot in the arm to the revitalization of Silver Spring” over the past two decades. Losing the company’s headquarters was difficult news to accept, but Hucker said he is optimistic about the future of the building, which gained international attention when it was festooned with a giant inflatable shark named Chompie during the network’s annual “Shark Week” programs. 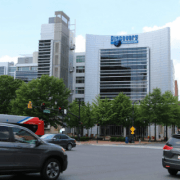 About 300 full-time Discovery employees will relocate to offices blocks away at Brookfield’s Silver Spring Metro Plaza from the One Discovery Place headquarters. The remaining employees do network and support functions and government relations in the offices at 8403 Colesville Road, according to the company. About 1,000 employees were either laid off or transferred to other Discovery sites. The 15-year-old building sold for $70 million, according to state assessment records.